Biocell Laboratories, Inc. is a producer of bulk diagnostic grade sera of human and animal origin and a leader in lipid technology for four decades. We are recognized as specialists in the processing of human and animal sera into exact protein matrices for controls and standards. Our sera has been tested and their performance compared to fresh samples and their immunoreactivity is excellent. The proprietary processing techniques used preserve the stability and integrity of these large, fragile macromolecules on bulk normal and fresh clot sera. An on-site testing laboratory with extensive instrumentation monitors raw materials and materials in-process to ensure maximum stability, clarity and quality of bulk sera. Provides a good base matrix for a variety of products such as controls and calibrators. “Opticlear” is Biocell’s key word describing optical clarity. It is an excellent base for the production of stable liquid controls and calibrators for immunoassay applications. Lyophilizes with little change in clarity upon reconstitution. Delipidization eliminates turbidity in serum, increases shelf life and improves appearance. Can withstand numerous freeze-thaws without affecting clarity. Integrates the key advantages of Biocell’s Opticlear and Analyte Stripped sera. Serum is processed by Biocell to provide you with a “0” base matrix for your specific applications. Available with specific analyte or hormone adjustments. Eliminates interference from turbidity or the presence of lipids. Human serum processed to reduce both T3 and T4 to zero values, making these sera suitable for use in the preparation of standards and controls. “Opticlear” is Biocell’s key word describing the sparkling optical clarity of this product. Delipidization increases shelf life and appearance. Low enzymes and low serum iron. Can be screened for your specific analyte needs. 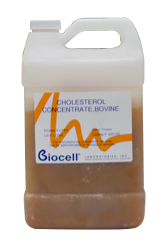 Biocell’s animal serum products provide precise protein matrices for calibrators/standards, controls and diluents for diagnostics. All collection and processing are done under temperature controlled conditions. Lot sizes vary from individual pools to thousands of liters. Biocell’s stringent in-house specification testing includes: endotoxin, microbial count, protein electrophoresis, pH, chemistry profile and is documented by a Certificate of Analysis. Opticlear version of Normal Bovine Serum. Opticlear and analyte stripped version of Normal Bovine Serum.